The Indivision AGA is, ss the name suggests, a flickerfixer that is very closely tied to the AGA chipset. This could only be achieved by putting the flickerfixer inside of the computer. 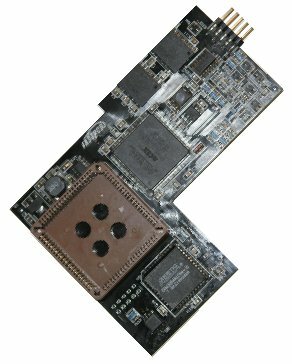 The product is mounted over the video chip "Lisa". The VGA display is connected directly to the flickerfixer. Further connections are not necessary. Two options have been added for retro-gaming enthusiasts that allow a step-by-step approximation to the display of an old TV set: Vertical synchronisation allows reducing the output frequency down to 49.9 Hz, which will eliminate tearing effects. In addition to that, a scanline emulation can be switched on. This will simulate the dark lines between the scanlines of a TV screen. 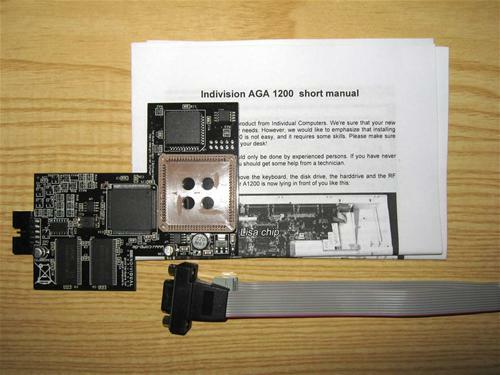 Please note that the Indivision AGA 1200 can only be used with an Amiga 1200 computer, it won't fit any other model.